Mean Machines, supercars, luxury rides, whatever you name them sets each one of our heart pumping. The whoosh of a sports car going past shoots up our adrenaline. But ever wondered about the place where these cars are staged, how lavish the showrooms can be? Let’s go on a virtual tour to some of the best in Delhi NCR. One of the biggest names in the luxury segment also hosts its showroom in Delhi at Moti Nagar. The showroom currently named as AMP motors is a delight to watch from outside and is equally fascinating from inside. AMP motors are the company that sell these beast kinds of machines. This showroom houses one of the most expensive and the most powerful cars. The cars showcased in this place are Jaguar XF, Jaguar XE, and Jaguar F Pace to name a few cars stored here. The showroom located in the northern part of the capital is a single floored showroom which should not be underestimated because that floor only can house the best or one of the best in India. With showrooms like these coming up in Delhi and its surrounding areas who need to wait for the Auto Expo which is held only in apportion of the year. You have these places to go and treat yourself. So what are you waiting for, when these cars can’t wait to steer down on the Delhi roads. 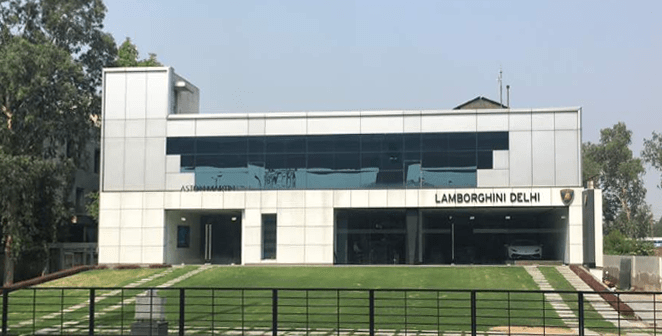 One of the newly opened showrooms in the automobile hub of Delhi has set the market abuzz; Lamborghini has put its best foot forward by opening its second showroom in India. 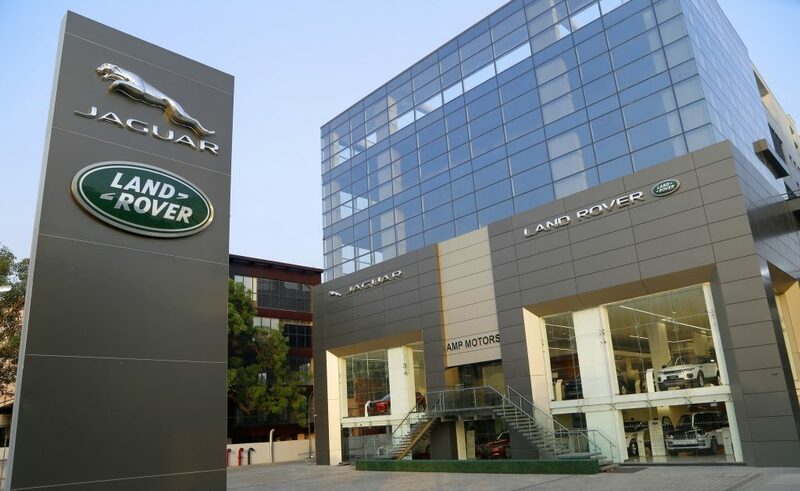 The leading Italian car making company has opened its showroom at Mathura Road, New Delhi which is by far one of the most flamboyant in India. The showroom flaunts the newly vast space which is built on an area of 4000 sq. ft. to keep the mean machines which look all the more stylish and ready to roll. Lamborghini is most famous for its model Gallardo and Aventador. The carmaker is trying to set its foot in the Indian market with the Mathura road showroom, equipped with the latest facilities to keep each model of the car safe and in check. The company which sold 12 cars last year plans on to sell 20. The Indian rich have an appetite for expensive cars and this Lamborghini showroom visit will definitely leave you mesmerized. showroom at Mathura road. As of now the dealership of this showroom rests with the landmark group which has been into this business since long and have had been franchisees of many brands including Mercedes Benz, Honda, and others. The products which would be on sale in this showroom are only two models that have been launched in India, Wrangler Unlimited and Grand Cherokee. While Jeep is planning on some more August, and end of year release, people visiting this showroom would be lucky enough to witness these great machines. The biggest advantage that Jeep has over its rivals is that it is also launching its Make in India model of the Jeep Compass. The showroom built in a great area has a ground floor and two floors above it which make room for every model to stand out. For the lovers of Jeep, visit this showroom to treat yourself with a view to leave you in bliss. Lexus opened its one of the most ravishing showroom in the heart of Delhi opposite to the iconic Le Meridien hotel. This one of a kind showroom in Delhi is theme based. It is based on the Japanese concept of “Omotenashi” that every person at Lexus abides. The showroom also hosts a gallery space, which offers a scintillating experience to the guests. In order to complement the design and precision of the Lexus vehicles on display, the designs have been taken from various design icons of the 20th century. Styling cues have been taken from the works of Piet Mondrian and noted Japanese-American woodworker, George Nakashima. The place where you would sit to finalize the purchase of your car showcases the design of the famous designer Le Corbusier, who prepared the plan for the city of Chandigarh. With such an exotic blend of national and international tastes, it will surely give you a delightful experience. To complement these exotic designs there is a line of mean machines lined up for you to delve yourself in. The showroom hosts the Lexus ES300h and the Lexus RX450h, both these cars in their new looks are looking more dapper and for sure are going to take your heart for a ride. This is by far one of the best showroom location wise plus also the designing and all of this complemented by their machines ready to rule the roads in Delhi. Get ready to experience the many facets of Porsche legend just near you at Golf Course Road Sector 53, Gurugram. It’s the first official Porsche Showroom to launch in India under Volkswagen Group. Consists of one of its kind fitting lounge where you can not only just configure your car online but get the true touch and feel of the individual fittings. At Porsche Centre Gurugram, they believe in building and maintaining relationships, not just selling sport cars. Experienced Founder with a demonstrated history of working in the automotive industry. Skilled in Marketing Management, Negotiation, Customer Service, Sales, and Business Development. Strong entrepreneurship professional with a Master of Business Administration (MBA) focused in Sales and Marketing Operations/Marketing and Distribution from ICFAI Business School.